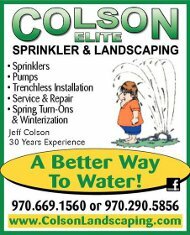 Landscaping Ideas – Colson Elite Sprinkler & Landscaping, Inc.
Plants that need less water than grass combined with decorative stone or wood mulch is the way of the future available now to add beauty to any landscaping. Cut back on how much you have to mow and maintain by increasing your xeriscaping. Water features are a great way to increase the value of your home. Waterfalls can be shaped out of boulders or flagstone to create just the look you desire. Each one is unique. Ponds and streams alone or with a natural stone waterfall can make your landscaping stand out from all the rest. Personalize your choice in timbers, flagstone, moss rock boulders, or Versalok bricks to create something stunning that is just what you want. Flagstone is beautiful and very versatile. It comes in many colors ranging from almost white to a deep red and sizes from 1-3” thick for paths & patios or up to 12” thick for walls, stairs and waterfalls. We can create stairs, patios, paths, walls, and waterfalls of any size and shape to suit your needs and budget. Walls, either decorative or retaining add character to your yard and increase its value. Colorado Red is mined locally along the Front Range. Now you have the ability to fertilize through your sprinkler system! This fertilizer unit is compact, in-ground, and fits in a standard size valve box. It requires no electricity as it is powered completely by water. Fertilize through your sprinkler heads and drip system to shrubs and grass. Different refill formulas for each specific growing season are available. Units start around $450 Call today to get yours and watch your grass get greener. Brick Pavers offer old world charm. They come in many colors and shapes to compliment your home. Add warmth to your landscaping. There is a local factory that makes a wide variety of styles and colors to choose from. Whether you choose flagstone or brick pavers you have many colors and textures to choose from to make your yard more beautiful.